It’s a carry-along entertainment and information centerâ€”AM, FM, CB, public service, aircraft, and weather bands, three-inch TV, cassette tapeâ€”along with a built-in mike and sleep switch. Six D cells power it. It’s $249.95, from Sampo, 1050 Arthur Ave., Elk Grove Village, III. 60007. Place this transparent screen over a CRT terminal and touchâ€”it will produce an analog voltage that represents the position of your finger. Converted to digital, it eliminates light pens or joy sticks. Price is $1500, from Elo-graphics, 1976 Oak Ridge Tpk., Oak Ridge, Tenn. 37830. The MD-4 computer mini-disc unit from IMSAI (14860 Wicks Blvd., San Leandro, Calif. 94577) uses conventional Mi-cropolis drives, but unconventional 1024-byte-per-sec-tor recording format. Result: an 18-percentâ€”780K bytes-increase in storage capability. It’s $1995 with MDOS and controller. This 12x9x2-1/22-inch display takes the place of a full-size computer CRT terminal. It displays 12 lines of 40 characters and is touch sensitiveâ€”you give commands by just touching spots on the screen. Price: $3500. General Digital, 700 Burnside Ave., E. Hartford, Conn. 06108. You push a button hereâ€”a light turns on over there. No wires to run, Sears’ remote control uses house wiring to actuate up to 16 separate appliances. Command console ($40) sends code to remote boxes ($15), into which you plug the appliances to be controlled. 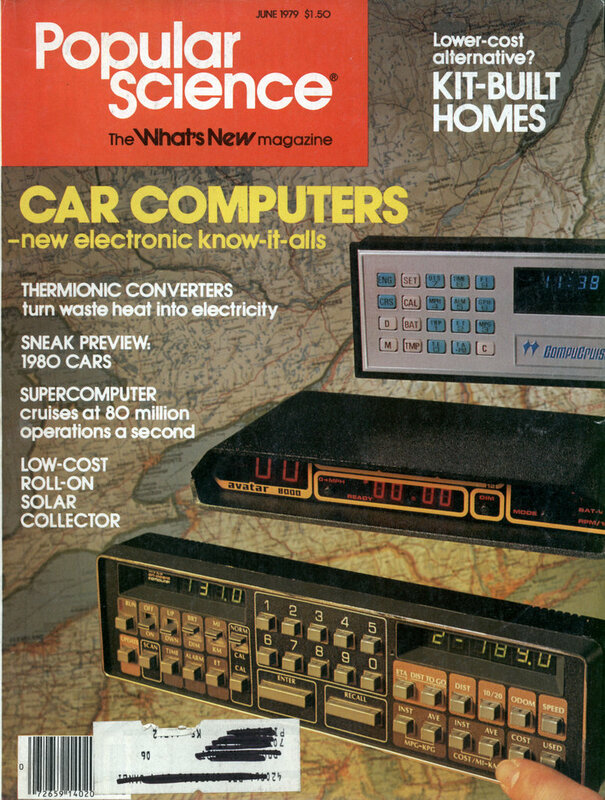 Here’s a look back at some of the cutting edge electronics as seen in Popular Science 1979, I like the “Everything set” and the “Goof corrector” – “” – Link……. Wow! The ORIGINAL Intellivision “keyboard component”. I don’t believe this ever went on sale to the general public, but we had one for about 6 months for testing. The Intellivision I console itself fit into a divot in the case, with a ribbon cable that plugged into the cartridge slot, and passthroughs for the RF out. I can’t remember how the power was handled. Basically this behemoth used the Intellivision I console for its graphics and controls (maybe) processing power. I’m pretty sure the console itself just thought it had a regular cartridge plugged into it. 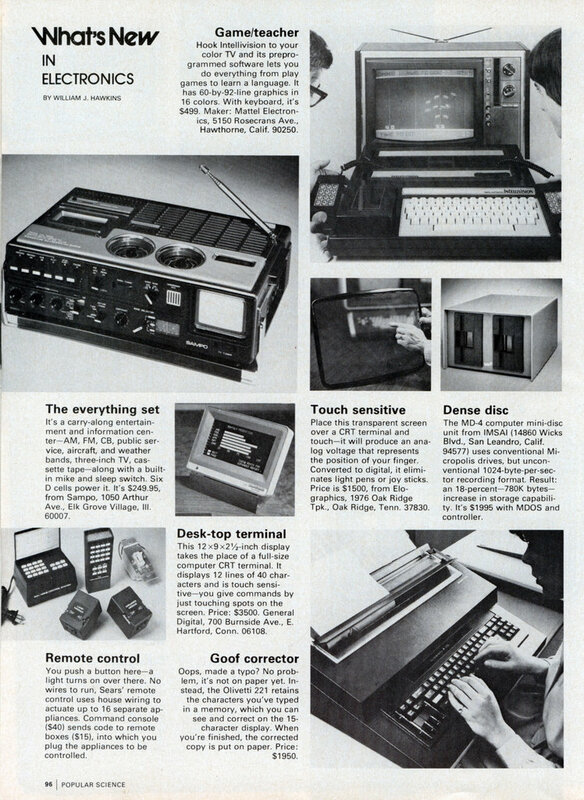 The “keyboard component” was a fullsize keyboard and it had a fully automatic cassette drive to the left. On the back was a monster port, into which fit the 8K BASIC cartridge. We only had two titles that used the cassette – Conversational French, and Jack Lalane’s Workout. The tape was only one-sided, so I’m guessing it was divided into a data track and a voice track, which blew our minds at the time… All of the sudden, our Intellivision was playing full-fidelity sound! It was a sad day when we had to give it back, but the second generation Intellivision computer system was pretty spiffy too. Nice to see a picture of the original, though. I was starting to think I’d imagined it.